Barbara Harman began her career as a college English professor, landing at Wellesley College in 1977 where she wrote three books and taught literature and writing for 25 years. 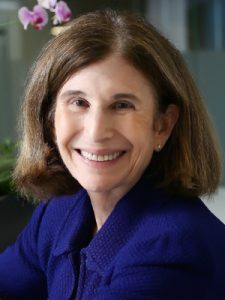 She became Executive Director of the Harman Family Foundation in 2000 and founded the Catalogue for Philanthropy: Greater Washington in 2003.The Catalogue annually features the best community-based nonprofits in the metropolitan Washington region, and has helped raise over $29 million to fuel their growth. Barbara is a member of the board of the Catalogue and a trustee of the Shakespeare Theatre Company. She received the Mayor’s Arts Award for Visionary Leadership in the Arts (with Jane Harman) and was named one of Washington’s “most powerful women” by Washingtonian Magazine in 2013 and again in 2015. She enjoys living half in a bucolic suburb west of Boston and half in the busy Penn Quarter/Chinatown neighborhood of Washington, DC. A graduate of Tufts University, she received her MA and PhD degrees from Brandeis University.